RIO DE JANEIRO: Tens of thousands of flag-waving Argentina fans packed Rio de Janeiro's Copacabana beach to watch the World Cup final on Sunday but Brazilians made clear who they were backing, shouting "Germany!" Huge crowds swarmed the crescent-shaped beach to see the game on a jumbo screen, with a sea of Argentina's white and blue colors dominating the postcard-perfect coast as the game got underway. Still smarting over their team's humiliating World Cup elimination, many Brazilians were backing Germany over their South American neighbors and football arch-rivals in the game at the iconic Maracana Stadium. "I don't want Argentina to win because otherwise, they'll mock me every time I go there," said Guilherme Limeira, a 20-year-old engineering student who painted Germany's flags on his cheeks and wore the European team's jersey. His cousin, Luiza Tendler, added: "I like everything about Argentina, except football." Since the tournament kicked off on June 12, legions of Argentines have flooded Brazilian cities, taunting their hosts with chants that their hero Diego Maradona was better than Brazil legend Pele. After Brazil lost 7-1 to Germany in the semi-final, Argentines held up seven fingers and chanted "They ate seven goals!" Brazilians chanted back that they had won a record five titles. After Brazil lost 3-0 to the Netherlands in Saturday's third-place playoff, taking the two-game tally to 10 goals, a group of Argentines walked down a Rio street in the dead of night and loudly counted to 10. Cars and buses packed with Argentine fans waving their country's white and blue flag and honking their horns streamed across Rio streets hours before the final. For Brazilians, seeing Argentina win on their soil would add insult to injury. "We're in a tough spot. We have the choice between our executioners (Germany) or our historic rivals, the Argentines," said Francisco Silva, a public worker. "I'm choosing Germany because if the 'hermanos' (brothers) win, they'll mock us for life." Silva was taking the subway near the Sambadrome, the open-air venue of the Carnival that the city opened for the countless Argentine motorhomes, buses and cars traveling there. "There has always been a great rivalry between us. They think they're the greatest in the world, and we do too," said Roberto Romeira, a 38-year-old Argentine accountant who camped out at the Sambadrome before heading to Copacabana. "They were convinced that they would be champions and it didn't turn out like they wanted. It's too bad they're supporting Germany. It hurts because we are all Latinos," Romeira said. But Ariel Westten, who like many Argentines has German roots, said he would never support Brazil either. "Nothing would hurt us more than seeing Brazil become champion, and nothing would hurt Brazilians more than seeing Argentina win," he said. Eric Turanza de Salta, from northern Argentina, acknowledged that Brazilians and other South Americans see Argentines as too arrogant and proud of their European roots. "Brazilians support Germany because of our delusions of grandeur. 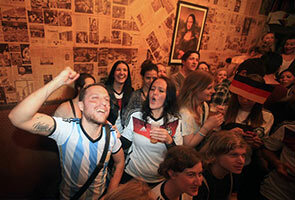 We are Argentines and we believe we're European, especially in Buenos Aires," he said. "The worst is that because of that, all of Latin America would support Brazil if it was Brazil-Argentina in the final." As for German fans, those enjoying the sun at the legendary Copacabana Beach were happy with the warm reception they have had in Brazil. "Nearly all the Brazilians are backing Germany. They can't bear to see Argentina win here," said 51-year-old Peter Stock of Germany, wearing the red and black away jersey that the Europeans wore when they beat Brazil. But some Brazilians are backing their South American "hermanos" (brothers). "I love Argentina," said Amarilio Carvalho, an esperanto teacher wrapped around a white and blue flag as Argentines line up to take pictures with him.